GnuCash has classified the main types of reports into major classes. These are all available under the Reports menu. The General Reports include the Account Summary Report, the Future Scheduled Transactions Summary, the Tax Schedule Report and TXF Export, and the Transaction Report and also the reports in the Sample & Custom menu. The tax schedule report lists all taxable income and deductible expense amounts used in the preparation of US Income Tax returns. The purpose of the report is to provide a complete audit trail for these amounts. The report is intended to be used by a tax payer to manually prepare his or her own tax return, or alternatively, to be provided to a tax preparer for that purpose. The report can also be used to generate an export of all tax related income and expenses to a TXF (Tax eXchange Format) file (this is in addition to exporting to the HTML format that all reports allow). The TXF file can be imported into tax filing programs such as TaxCut or TurboTax. The report should be run, inspected carefully for errors or omissions, and then corrections made to transactions, report settings, currency conversion rates or the account structure as needed. This process should be repeated as often as needed until all the amounts on the report are correct before a final version is used and saved along with the tax returns. For accounts specified in the report options (none = all) that are also flagged as Tax-related, all transactions for the time period selected (also in the report options) are included. The report sorts transactions by date within account providing subtotals by account within tax code within Form or Schedule line number. Support is also provided for multiple copies of and for sub-line items for selected Forms/Schedules. Optionally uses special date processing to include federal estimated tax payments after year end. All totals are in USD since this is the currency required for filing US Income Tax returns. Non-USD transaction amounts are converted to USD using the transaction conversion rate to USD, if available. If not, a conversion rate from the price database is used (either the date nearest the transaction date or nearest the report date as specified in the report options; if none is available, transaction amounts are converted to zero and the report provides a comment accordingly). A complete audit trail of conversions is provided. For this to work, the user has to segregate taxable and non taxable income to different accounts, as well as deductible and non deductible expenses. The Income Tax Information dialog is used for this. To access the Income Tax Information dialog go to Edit → Tax Report Options. The user also must set the TXF category of each tax related account. The Income Tax Information dialog is described in the Section 10.5, “Setting Tax Report Options” section. This report lists transactions in selected accounts during a specified financial period. Two fields may be optionally used for sorting and totalling. 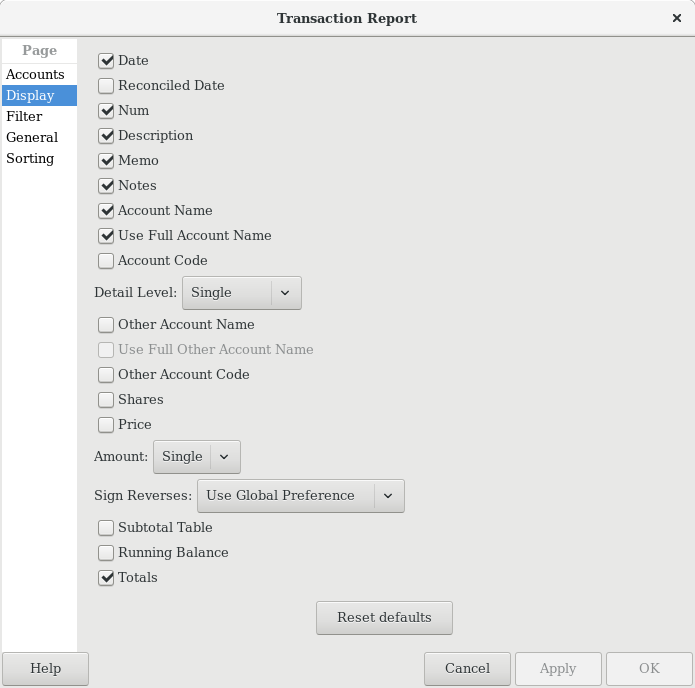 This is an image of the Transaction Report, Report Options, Display tab. Accounts: Select one or more accounts to be reported. Show Hidden Accounts: Show accounts that have been marked hidden. Date refers to the 'posted date' i.e. effective date of a transaction. Reconciled Date refers to the 'date of reconciliation' of a transaction. Num is commonly used for check numbers. Memo is the memo field of a transaction. This can be used as a secondary description of a transaction. Account Name will print the account name containing the transaction. Use Full Account Name if the account name is enabled, this option will display the full account name hierarchy. Account Code this refers to the 'account code' related to the account. Before stable version 3.0 Detail Level was called Style on the General tab. If Detail Level is Multi-Line, check boxes Other Account Name and Use Full Other Account Name are automatically deselected and disabled, and the Transfer column is not reported. Other Account Name: For multi-split transactions, this parameter should be unticked. See below for more details. Use Full Other Account Name will enable display of full corresponding account name. Other Account Code will enable display of corresponding account code. Subtotal Table will add a summary table for the various subtotals generated in the report. It lists the same subtotals generated in tabular form. Running Balance refers to the running balance of the account holding the transaction. Totals will add a 'Grand Total' line adding all transactions in the report. Global Preference Use reversing option specified in global preference. Account Name Filter will include only selected accounts containing the substring. Alternatively, if the next option is checked, the account name filter will be matched according to full POSIX regular expressions. Use regular expressions for account name filter toggles regular expressions for account name filter. Transaction Filter will include only transactions which contain this substring in the description, notes, or memo. Alternatively if the next option is checked, the filter will be matched using full POSIX regular expressions. Use regular expressions for transaction filter toggles regular expressions for the transaction filter. In stable version 3.0, the Style option will be renamed to Detail Level and moved to the Display tab. Add options summary: Adds an informative text describing options that were changed by user. This is mainly useful for troubleshooting reports. Show Informal Debit/Credit Headers: Show informal names for debit/credit in the subtitles. This requires that subtotal is enabled, and the primary or sortkey is account or account code. Add indenting columns: Add columns to align transactions within the same grouping together, and can be useful to highlight groups. Show subtotals only (hide transactional data): Will hide transactions. This may be useful for reports whereby only subtotals are required. This is controled by the Detail Level option on the Display tab. In stable versions before 3.0 this option was called Style on the General tab. b. "Split" if there are multiple other splits in the transaction. You can't display multiple "other" account names in one line. There's just no room for it. In the case of Multi-Line mode, this report uses a completely different concept. For each transaction, every split (both the split in this account and the split(s) in the other account(s) !) is printed on a separate line. And every split really means every split: both the split which belongs in the account being reported and the split(s) in the other account(s) that balance the transaction. So even the most basic transaction, with only two splits (this account and other account) will print two lines in multiline mode. then on a Transaction Report for the bank account the details appear pretty much as above. When this transaction is printed on the bank account's Transaction Report in Single line mode, then under other account it simply prints the word split instead of the account name. To display the additional split detail, you need to set Single/Multi-Line to Multi-Line and then tick Display -> Account Name. Do NOT tick Display -> Other Account Name. You can choose whether or not to turn off the full account name using Display -> Use Full Account Name. Use Full Other Account Name has no effect in Multi-Line mode. The Assets & Liabilities reports includes the Balance Sheet report, Investment reports and the Net Worth report. Symbol: Ticker Symbol/Abbreviation as defined in the Security Editor. A report option can suppress this column. Listing: Type as defined in the Security Editor. A report option can suppress this column. Shares: Number of shares (quantity). A report option sets how many decimal places to show. A report option can suppress this column. Price: Unit market price as at report date. A report option can suppress this column. Basis: Cost of all shares acquired by any means, including brokerage fees if the option to include them is checked. Report option Basis calculation method can be set to Average, LIFO or FIFO. Money In: Sum of the cost of stock purchased, excluding stock acquired as part of a Dividend Reinvestment Plan. I.e. External money used to purchase shares. Money Out: Money from selling shares or a spin off transaction. Realized Gain: Money received for selling shares minus basis for shares sold, minus brokerage fees for the sale if the option to include them in basis is checked. Income: Total of all income transactions associated with a stock account. Ensure there is a dummy transaction split to the stock account with quantity 0, price 1 and value 0 in the dividend transaction. Enter the dummy stock split with no values in the dividend account and it will create the transaction with price 1 even though you cannot see the Price column in that register. In GnuCash 2.6.6, this report was modified to simplify the recording of dividend and interest payments. With this change it may not be necessary to include the dummy stock split in the transaction. The report will find income (and expense) transactions that are in the parent account of the stock account being reported on. This is done by looking in the parent account for transactions that have exactly two splits (not counting trading account splits) where the other split is to an income or expense account with the same name as the stock's account. A transaction that debits the "Assets:Broker" account and credits the "Income:Dividends:Widget Stock" account will count as income even though it doesn't have a split with account "Assets:Broker:Widget Stock". This only works if the parent account ("Assets:Broker" in this case) is a Bank or Asset account and the Income/Expense account has the same name as the stock account. It won't double count transactions that have a dummy split since they won't have exactly two split transactions. It will not work if the income or expense account split is to a subaccount of the account with the same name as the stock account i.e. "Income:Dividends:Widget Stock:Franked"
Include accounts with no shares: Unchecked (default) or checked. Show ticker symbols: Checked (default) or unchecked. If unchecked, Symbol column will be omitted. Show listings: Checked (default) or unchecked. If unchecked, Listing column (source of shares price quotes) will be omitted. Show number of shares: Checked (default) or unchecked. If unchecked, Shares column will be omitted. Share decimal places: The number of decimal places to show in the number of shares. Default is 2. Show prices: Checked (default) or unchecked. If unchecked, Price column will be omitted. Price Source: Nearest in time (default) or Most Recent. Basis calculation method: Average (default), FIFO or LIFO. Set preference for price list data: Checked (default): Use price list data. If there is no relevant price list data, transaction prices will be used and there will be a warning. Unchecked: Get prices from stock transactions. How to report brokerage fees: Include in basis (default), Include in gain or Ignore. The Asset Barchart report displays bars that present the value of all assets in a GnuCash file over time. By default, the report shows all accounts in Accounts Receivable, Current Assets, Fixed Assets, Investments and Special Accounts (if they exist) and it displays monthly bars for the current financial period. This report provides a graphic view of the assets in the file over time. Like all the generic reports, the user can assign a title and save the report with it's selected options for re-use later. The display is in the form of either a stacked barchart or simple barchart with an option to display a table of the values. This report calculates and displays a default of 8 bars or up to 24 separate asset accounts value at the end of the day on several dates through a specified time period. The report automatically selects the most significant accounts to display with all other selected accounts summed as Other. The report exploits the outline structure of the chart of accounts to allow the user to select top level accounts and sub-accounts down to a user-selectable depth. Selected sub-accounts below the selected depth are automatically summed up into the next level when it is also selected. The default number of sub-account levels is 2, giving a summary view. Increasing the number of sub-levels increases the detail available to display. It is possible to un-select a higher level account and leave sub-accounts selected to force greater detail to appear in the report. By default the report includes all asset accounts and sub-accounts, as well as Imbalance and Orphan Special accounts in whatever currencies or commodities may be present. The report's base currency is the default currency of the GnuCash file but if the file has data for multiple currencies, then it can be changed to another currency. Since each account may be individually selected, the report can be designed to focus on a small subset of data such as current assets or investments. The overall interval of the report defaults to start at the start of the current accounting period and to end at the end of the current accounting period. Numerous other starting choices and ending choices are available. The first bar shows the selected values at the end of the day on the first date chosen. There are a number of choices for step size from day to year with the default being month. Note that if any step date would fall on the 29th, 30th or 31st in a month that does not have such a date the next interval will be 31 days later. For that step only the date will slip up to 3 days into the following month. This is true for releases at least through 2.4.13. Bug 639049 is open in Bugzilla to modify this behavior. Currently, there is no option to start the report on the last day of any period. There is also no option to show beginning balances or end of previous step balances. This makes it difficult to correlate this report to business quarterly reports, for example. The Net Worth linechart report, Liability barchart report and Net Worth barchart report are similar except for the graphic type and default account groups selected. Other features are customizable in a manner similar to other standard reports. Balance Sheet: This report summarizes assets, liabilities, and equity. When properly maintained, assets should equal the sum of liabilities and equity. If that is not the case, there is some kind of internal imbalance in the accounts. Investment Portfolio: This report summarizes the value of the stocks in the current portfolio. Net Worth Barchart: Net worth is the difference between the value of assets or liabilities. Net Worth Linechart: Net worth plotted over time. Net worth is the difference between the value of assets or liabilities. The Business Reports includes Customer and Vendor Reports and Printable Invoices as well as Aging reports. This report provides a listing of vendors and their aged outstanding balances. Vendors may be included if they have posted business transactions (e.g. invoices) for the selected accounts payable account. It shows their current balance, and how much they have due from invoices over time periods 0-30 days, 31-60 days, 61-90 days, and over 90 days. The report also contains links to each vendor and to their current vendor report. Optionally, vendor address details may be also shown. To export vendor address details, say in order to do a mail merge, select the optional vendor address details in the report options display tab, apply the options to regenerate the report, then copy and paste the report into a spreadsheet. Alternatively, the report can be exported to a .html file, then read into a spreadsheet. See Common Report Options in the Configuring Reports and Charts section of this help manual for more details of the common options. Report name: Enter a descriptive name for this report - see Common Report Options. Stylesheet: Select a style sheet for this report - see Common Report Options. To: Select a date to report on or a named date. Transactions up to and including the selected date will be used to calculate the outstanding aged balances. See Common Report Options. Average Cost The volume-weighted net average price of all exchanges. Show Multi-currency Totals: If not selected, all totals are shown in the report currency. Show zero balance items: Show companies even if they have a zero outstanding balance. Payable Account: The accounts payable account used to select vendors to be reported. Vendors are included if they have a posted business transaction (usually an invoice) on or before the report date and also meet the Show zero balance items criteria. Address Name: Display vendor address name. This, and other fields, may be useful if copying this report to a spreadsheet for use in a mail merge. Address 1: Display address line 1. Address 2: Display address line 2. Address 3: Display address line 3. Address 4: Display address line 4. Phone: Display address phone number. Fax: Display address fax number. Active: Display vendor active status. This report provides a listing of customers and their aged outstanding balances. Customers may be included if they have posted business transactions (e.g. invoices) for the selected accounts receivable account. It shows their current balance, and how much they have outstanding from invoices over time periods 0-30 days, 31-60 days, 61-90 days, and over 90 days. The report also contains links to each customer and to their current customer report. Optionally, customer address details may be also shown. To export customer address details, say in order to do a mail merge, select the optional customer address details in the report options display tab, apply the options to regenerate the report, then copy and paste the report into a spreadsheet. Alternatively, the report can be exported to a .html file, then read into a spreadsheet. Report's currency: Select the currency to display the values in - see Common Report Options. Receivables Account: The accounts receivable account used to select customers to be reported. Customers are included if they have a posted business transaction (usually an invoice) on or before the report date and also meet the Show zero balance items criteria. Billing (default) Address fields from billing address. Shipping Address fields from shipping address. Address Name: Display customer address name. This, and other fields, may be useful if copying this report to a spreadsheet for use in a mail merge. The Income & Expense reports includes the Cash Flow and Income Statement reports. Profit & Loss: This is the same report as the Income Statement but with a different title. Trial Balance: This report summarizes sources of income and expenditure. This report is used to place multiple reports into a single report window to examine a set of financial information at a glance. This report is used to compare budgeted and real amounts for selected accounts. It allows you to review how well you follow the budget. The report is generated as a table in which each row represents an account and each set of columns shows the budgeted amount, the real amount, and the difference between them for each report period. Each entry in the real amount column is the sum of all the splits in the row's account over the column's period. For example, if the report is set up for monthly periods, the column is for May, and the row is for Expenses:Groceries, then the value will be the sum of all Expenses:Groceries splits for that May. The report supports selecting a range of periods instead all of them. Periods that are out of range can be included in the report as the consolidated columns around the selected range. This allows you to focus on particular periods, for example the current one, and is especially useful for budgets with many periods. For example, if you have a 12 period budget you can make a 3 column report with the format "(all periods before columns set) (current period columns set) (all periods after columns set)" that is easily fits on the screen and allows you to match values with account names. Here we describe only options that are specific for the Budget Report. You can find information about standard parameters in Section 9.2, “Configuring Reports and Charts”. Show Column with totals - Adds a final column set containing budgeted, real value, and difference columns summing those values across all periods of the report. Include accounts with zero total balances and budget values - enables display of accounts with no budget or splits in any period. Report for range of budget periods - Enables reporting on a subset of the budget by selecting a beginning and an ending period. Previous - select previous period. Current - select current period. Next - select next period. The current, previous, and next options select the period based on the date on which the report is run, with current being the period in which the date falls, previous being the one before that, and next the period after. If the current date falls outside the date range covered by the budget, the first or last period will be used as appropriate. Include collapsed periods after selected - if on, then includes in the report all budget periods, that are after selected period range, as a single consolidated column set.